Despite some welcome improvements, HMRC's performance in answering calls from the public is poor value for money. "The taxpayers and claimants who phone HMRC do not have a choice about whether they interact with the department. Despite some welcome improvements, HMRC has acknowledged that its performance in providing services to the public has been unacceptable. "HMRC faces difficult decisions about whether it should aspire to meet the service performance standards of a commercial organization. It could do only by spending significantly more money or becoming substantially more cost effective." A report by the National Audit Office into the customer service performance of HM Revenue and Customs has concluded that, while the department has made some welcome improvements to its arrangements for answering calls from the public, its current performance represents poor value for money for customers. Today’s report recognizes that HMRC has restored customer service levels from a low point in 2010, when problems with the new National Insurance and PAYE system increased the number of queries. HMRC has now dealt with long-term backlogs by employing 2,500 temporary staff, enhancing phone technology and improving productivity. In 2011-12, HMRC answered 74 per cent of phone calls, against an interim target of 58 per cent. This level of service is nevertheless low. For example, 20 million calls (including calls where customers rang back because they did not get through first time) were not answered. So far in 2012-13, HMRC has improved its handling of post but its performance in handling calls has been varied. 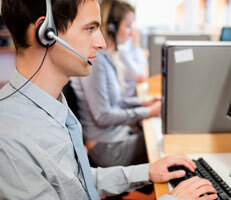 However, in October 2012, HMRC answered 91 per cent of calls, its highest monthly performance since December 2009. Customers who got through to HMRC in 2011-12 had to wait on average 282 seconds to speak to an adviser. Between April and September 2011, 6.5 million customers waited more than ten minutes to have their call answered. Depending on the tariff they pay their phone company, customers are charged from when their call is connected even if they are held in a queue. The NAO estimates that it cost customers £33 million in call charges while they are in the queue. The estimated value of customers’ time while they are in the queue is £103 million. Most of HMRC’s numbers are still 0845 numbers which result in high call charges for some customers. It is investigating alternatives as it negotiates its new telephony contract. HMRC estimates customers would save £13 million annually if all 0845 numbers were replaced with cheaper 03 numbers. HMRC has plans to achieve service targets but they are ambitious, given previous performance and the need to reduce staff. NAO analysis indicates that, by the end of 2012-13 and through 2013-14, HMRC could achieve its target of answering 90 per cent of calls. However, by 2014-15, HMRC will have reduced numbers of contact centre staff so will need to redeploy large numbers of back-office processing staff to answer telephones. There is also uncertainty about the impact on call volumes of large-scale changes, such as the introduction of Real Time Information and the transition to universal credit.